We had a busy weekend at Judson Memorial, our liberal and artistic church on Washington Square South. The occasion was the opening last Thursday night of an exhibition at the adjacent Fales Library at New York University entitled "A Sanctuary for the Arts: Judson Memorial Church and the Avant-Garde 1955-1977" curated by Joanna Steinberg. Because, chickens, Judson Memorial Church has a very important place in the history of avant-garde art in the Sixties. Judson was built in 1888-1893 on the designs of McKim, Mead & White with backing from John D. Rockefeller. The church was meant to link the poor Italian immigrants of Greenwich Village with the wealthy residents of Washington Square. But by the 1950s membership had dwindled so the church leaders reinvented the institution as a church that supported experimental artists working in visual art, theater and dance. Young modern artists including Claes Oldenburg, Robert Rauschenberg, Lucinda Childs, Trisha Brown, Meredith Monk, Twyla Tharp and many many more were nurtured and grew at Judson in our very own Meeting Room. At a time when even folk singing in the park was illegal, Judson provided a sanctuary for artists with no censorship. Still today, Judson links spiritual, political and artistic activities, describing itself as "a church in the Christian tradition and a sanctuary for progressive activism and artistic expression." Good combination, no? Before the exhibition opened on Thursday night there was a very interesting round table discussion at Judson (pictured at the top) with several artists recalling their memories of Judson. The composer and violinist Malcolm Goldstein said, "Judson changed the way we thought of ourselves as artists because there was no constraint. It is a fantastic space," he said looking around the Meeting Room. "This was my school and it feeds us forever." After the discussion we walked over to Fales, two blocks down Washington Square South, to view the exhibition, which is up until January 7, 2011. TD designed a beautiful catalogue for the show which tells the story very well. Then on Friday and Saturday nights, two dance performances in honor of Judson were held in the Meeting Room which included some original dances and some works from the Sixties. TD and I went on Saturday night. Claes Oldenberg, who is now 81 and had designed a colorful poster for the dance performances, was sitting in the front row. 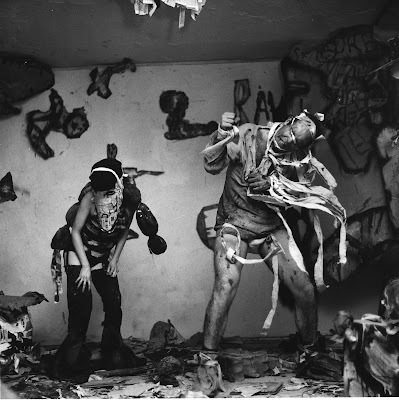 The dances were interesting, provocative, challenging – what can I say, they were avant-garde! 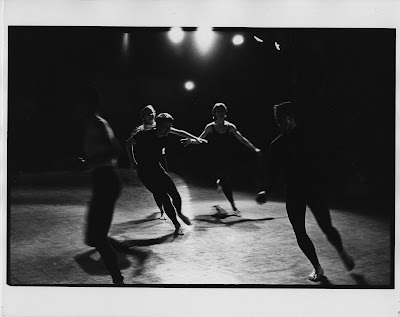 The crowd favorite was Yvonne Rainer's Trio A: Geriatric With Talking, in which the choreographer, who said she was 76 and wore thick-lensed glasses which magnified her eyes, walked through her renown piece and talked spontaneously about how her body couldn't do the moves anymore. It was clever and funny and touching. You can read The New York Times review of the evening here. Finally, after the dance performance on Saturday night, Judson hosted a reception in the Meeting Room to thank every one involved in the events and celebrate the occasion. The room was to be transformed quickly from a dance space to a festive party with tables and food and drink. Yours truly was asked to do the decor. I always follow the motto "KISS – keep it simple, sweetie." We start with white linen table clothes and up-light votive candles that create a flattering canvas which makes everyone look good. To that blank canvas we add color. 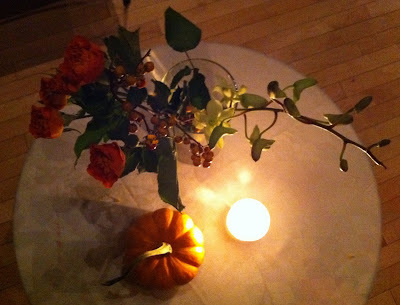 It was the night before Halloween so I went with an orange theme. 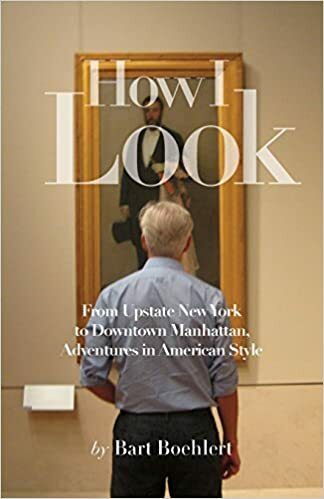 I had scoped out some delis in the neighborhood, and the day before the event I went to my favorite one on Seventh Avenue for some orange roses. (A friend asked me if I buy flowers at the crack of dawn in the flower district on 28th Street. I said, no I go to the deli on Seventh Avenue!) 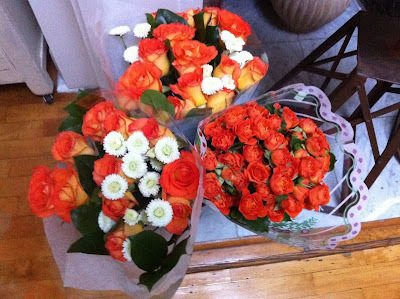 But the guy at the deli said had he no more orange roses. Oh no! He went down to the cellar to look. Nope, no orange roses. Then he opened up a long narrow box lying on the sidewalk. Phew, it contained orange roses. They looked quite tiny and I considered not buying them but he had gone to such an effort that I took them anyway. Luckily when I brought them home they opened up larger and larger. The morning of the event I went to the Union Square Farmers Market and bought branches of pepper berries from the Durrs. And I bought more than a dozen little orange pumpkins. 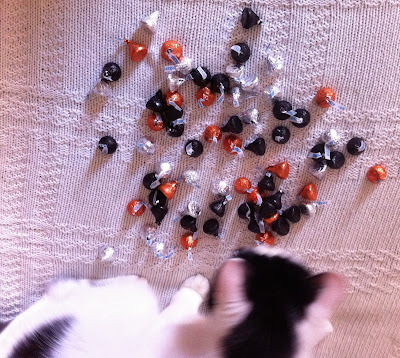 At Duane Reade I got some bags of Halloween candy kisses in metallic silver, orange and black which I thought would sparkle nicely next to the votive candles. Here is Bell, inspecting. I lugged it all over to the church during the day and arranged the elements in vases. We also had some orchid stems donated from an NYU event. I lined up the vases so they would be ready to go that night. After the last dance was over, with many good helpers, we quickly transformed the room and arranged the tables. I got the lights dimmed. If you get the lighting right, you're 80% there. The roses opened up spectacularly. Here is the buffet table. It really was a very nice party, pulled off completely by church volunteers. I liked how the pepper berries mixed with the roses. I was happy with how the room looked. I wanted to honor the space, in my own way. I would have done the same thing as you when you bought the tiny flowers feeling pity for the person who has tried to help you. Thank's for the KISS! I will use it when it's too much in life. I think KISS is good to remember!